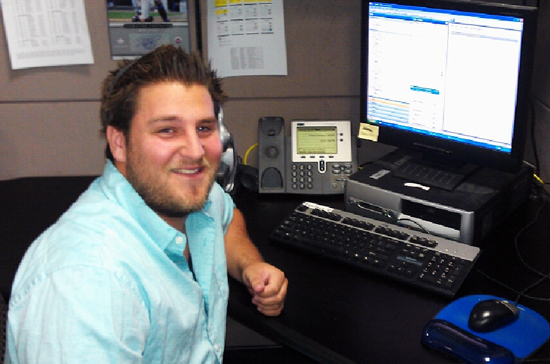 Gregg Cacioppo runs the Customer Care division for Upper Deck. Ask Upper Deck: Many people feel redemptions are one of the bigger problems in the industry. What has Upper Deck done to eliminate their use? 1) Increasing Signing Time – We have worked to build more time into allowing athletes to sign and return cards to us in the production schedule. The more time we give them, the more autographs we can get back in time for the release of a new Upper Deck product. 2) Improved Network of Signing Witnesses – We have worked very hard to create and build a solid network of representatives to witness autograph signings for us not only in the United States and Canada, but around the world, especially in Europe. We have dedicated representatives who will aggressively pursue signings with athletes at all ours of the day. 3) Making the Most of Events – Upper Deck targets certain events each year where we know a high concentration of athletes will be where we can acquire signatures. Events like the NHL All-Star Game and the NHL Rookie Showcase provide us with great opportunities to catch players when they are in a festive mood and get them to sign for us. While these events are a lot of fun, we are all business on site as it is an excellent opportunity to score signatures of players that collectors covet. 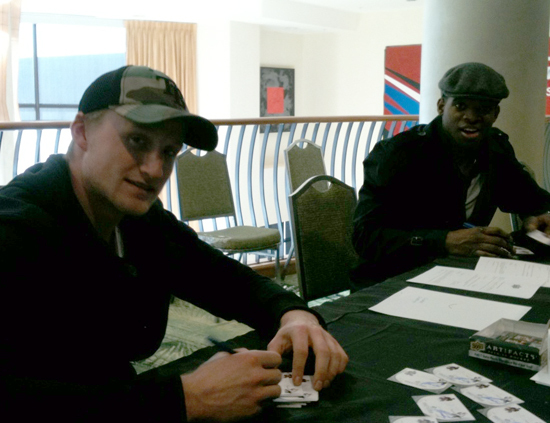 Steven Stamkos and P.K. Subban autograph new trading cards at the Upper Deck Signing Suite at the 2011 NHL All-Star Game. 4) Avoiding Poor Signers – This is a tricky one. Without naming names, there are players who traditionally do not like spending their time signing trading cards. It doesn’t make them bad guys as most players have a lot on their plate. Unfortunately, many of these players are the players that collectors would love to get an autograph from. So we walk a fine line here of working with their representatives on smaller deals that are manageable for those athletes while walking away from deals that are not working out. It is a very delicate situation, but one we have become very good at in most cases. 5) Autograph Labels – This used to be a much more acceptable process, but has now become one we stray away from more and more, especially on higher-end releases. We used to frequently have athletes sign autograph labels and then apply those labels to trading cards. It was great for us because athletes could sign almost all the autographs we would need for the season in one sitting and we could warehouse those signatures until the cards were needed. Collectors however became disenchanted with this process as they felt since the athlete wasn’t actually touching the card, it wasn’t as special. We now only really use autograph labels with lower-tier and early season products, but they do provide a way to avoid redemptions. For example, 2010-11 Upper Deck Series One Hockey packed out with 100% autograph content in packs (0% redemptions) thanks to the use of autograph labels. 6) Delaying Product Launches – This is a difficult area as well. We work very hard to meet the release dates we set for our customers and collectors. It’s important to share to the industry, however, that Upper Deck feels that redemptions are public enemy No. 1 and we are going to do everything in our power to avoid them, even if that means delaying a product launch. This means that Upper Deck cashes checks and charges credit cards later on a product release which is a difficult business decision, but we’ve heard loud and clear that our customers do not like redemptions. If we can provide athletes a few more weeks to get their autograph cards back to us, than we can avoid putting more redemption cards into the market. We strongly believe that it is better to apologize for delaying the release of a product than it is to put it out into the market and have collectors have a bad experience because of high redemption rates. 7) Pulling Redemptions from New Products – I often here collectors say, “If you don’t have the autograph card in house, just don’t include it.” It is not always that easy as we build in these autographs to hit ratios and meet the orders we have from our customers. We are okay with cutting orders thought to remove autographs redemptions we do not feel confident about however. Right before the actual “pack-out” process begins where all cards are inserted into packs for new releases we meet to go over which autograph cards we are still waiting on and which redemption cards we will be putting into the market. If we do not feel strongly about the athlete signing the cards in a timely fashion for us, we routinely make the decision to pull them completely from the product. That means we produce less product and will make less money, but it is more important to Upper Deck that our customers have a good experience with our products and continue to collect them in the future. There are occasions where we will ultimately get these cards in later. In those situations we update the checklist and get them out to the market through redemption replacements. 8) TBD and Mystery Redemptions – These are relatively new redemption programs for us. So frequently we have most redemptions come back to us in a timely fashion from athletes, but it seems like there is always one or two situations that pop up where an athlete loses the cards or they’re returned severely damaged. In those cases it would be great to just cut ties and move on to the next product, but we have redemptions out for that specific card so we need to make it. Producing less redemptions for a category of card and noting them as “TBD” or “Mystery” allows us to walk away from those bad circumstances and avoid situations where a collector is waiting for over a year on a redemption card. Collectors have had mixed feelings about these types of cards thus far as they like to know who they will get, but the use of these cards will help us get autographs out to collectors in a more expeditious fashion. 9) Online Redemption System – Upper Deck was the first trading card manufacturer to move to an online redemption system allowing collectors to enter codes online and be able to check the status of their redemption cards. No longer would collectors have to spend money on shipping cards off to us and hoping they were received and entered okay. It took other manufacturers several years to come up with similar redemption systems. We were the first to take the time to do so because we knew it would improve the customer experience on these programs and make this process more user friendly which was very important to Upper Deck. 10) Moving Redemption Department – Recently we completed a move for our redemption team to be closer to our printing plant in North Carolina. This move will help collectors get their redemption cards faster. It used to be that cards would be shipped from there to Carlsbad and now that we have our team set up out there, we can avoid those shipping times. This also alleviates situations with lost, damaged or misdirected shipments improving the overall quality of the cards our customers receive from us. We have a conference call each week between our Redemption team in North Carolina and our Management team in California where we go through outstanding redemptions and how we can get cards finished to our collectors. Streamlining our distribution while improving communication is paramount to getting these cards done and out to those fans waiting on them. Ask Upper Deck: Why can’t Upper Deck tell me when an athlete is going to sign my trading cards? Gregg Cacioppo: We have made a business decision not to share signing schedule information about our athletes unless they are absolutely set in stone. Professional athletes have a tremendous amount of demands on their time and frequently signings sessions we have scheduled change. That is why we do not want to share that information with fans because if they do change, we know we will just be disappointing you. Trust and believe that we are doing all we can at all hours of the day and night to get these cards signed and out to those waiting for them. Most athletes like Carey Price have fun signing cards, but with so many demands for their time, it is hard to say with certainty exactly when they will be able to sign for UD. Ask Upper Deck: I don’t want to wait on my redemptions any longer. Can I have them exchanged? 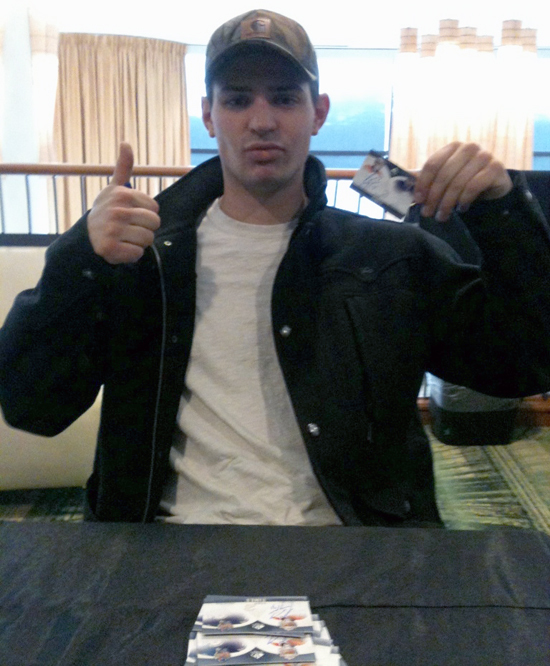 Gregg Cacioppo: In the event you have been waiting for an autograph redemption card that has been redeemed in our system for over 40 days without seeing movement on it, you can request a redemption. Please note, collectors cannot request replacements for unsigned draft pick or rookie redemption cards that are produced during the season. Customers waiting on these cards simply need to email Upper Deck at time2swap@upperdeck.com with a list of cards you want exchanged (it is best to just cut and paste this from your redemption account), a list of sports and teams you are interested in and we will take it from there to get you a comparable item. Fans without email access can also call Customer Care at (800) 873-7332 to request an exchange. Ask Upper Deck: If I request a comparable replacement card for my redemption, how long after I submit my request will I have to wait to receive my actual replacement card? Gregg Cacioppo: Unfortunately there is not an exact time frame from that point. It is very important for us that if someone wishes to have their redemption card exchanged, we do our due diligence to replace it with a card they will be happy with. By giving us time to do that, you will likely receive a better replacement as we explore inventory that’s available to come up with a replacement you will hopefully be happy with. Our inventory changes so frequently that the more time you give us on a replacement, the better the opportunity we have to find something you will really like based on our latest allocations. Additionally, we normally replace cards by sport in an assembly line fashion. So if we just worked on the sport you requested you could be waiting four-to-eight weeks for a replacement (not including shipping time). But if we just started the sport you requested, you could have a replacement in a couple weeks. Lastly it depends on how difficult it is to replace the item. We no longer have a lot of inventory on Baseball, Basketball or Football cards, so if you absolutely want a card from one of those sports, we ask for your patience as we just are not releasing as many of those products as we used to. Additionally if it is a very limited or rare card, we want to take time to make sure we come up with something you will be happy with by pulling from recently expired redemptions or new trading card sets. We work to get replacements done in an expeditious fashion, but we need to take the time to make sure we do them right. We understand that as collectors are all different, sometimes they will not always be completely satisfied with their replacement card, but we work very hard to try to find them the best replacement possible. Have patience with your request and know that we are exploring all options available to get you a comparable replacement. Ask Upper Deck: If I received a replacement card, but find out later that my actual card was signed and fulfilled, can I send back my replacement to get the original card I was waiting on? Gregg Cacioppo: Once you make the decision to replace your redemption card, you are forfeiting your rights to that card. It moves to replacement redemption stock for us and will be used for other projects. Unfortunately we cannot trade you back for the original card if your card has already been exchanged. I should note, there are times where we will have replacement requests in for cards we believe will be coming back very soon. In those instances we will hold those replacement requests for a bit to try to get you the original card you were hoping to receive. So, after reading all that, when is Ovechkin going to sign the cards for The Cup? I have been waiting forever. I really wish more collectors read this blog. We just complain and complain about redemptions without realizing all that happens behind the scenes to get us our cards. I never knew you guys pulled redemptions from products before. Thanks for all the efforts on improving this process. It means a lot to some of us out here and you are clearly doing more than your competition. As we shared above, due to frequent changes in signing sessions, we do not communicate when we plan on having athletes sign. It gets too frustrating for our fans to see those dates change due to the busy schedules of these premier athletes. You will be updated the cards have been signed on your online account through a status change that indicates the cards are now in house and ready to ship. Thanks for all of this wonderful information; it is very helpful to understand the constraints under which Upper Deck is often forced to operate. Can you clear up one concern for me? One of my redemptions was supposedly “shiiped” on June 10th but has yet to arrive as of June 28th. Is there a chance that during this extensive move (to North Carolina) that it is still “preparing to be shipped”, or should I be concerned that the redemption was misdirected in the mail. I think all collectors are working under the assumption that if the UD redemption website reads “shipped on June 10th” that it truly means it has left the center and is in the USPS hands. Thanks! So, could you provide an idea who the sign of the time mystery duals will be? And an approximate timeframe that you are hoping to have these start coming in? Hang in there Todd. That actually shifts when the label prints so they were likely mailing a lot out at the time. Robert, we will hopefully be able to share that with you soon, just need a few more to come in which we expect to arrive with some signatures for The Cup.